This model contains partial differentials and as such can not currently be solved by existing CellML tools..
ABSTRACT: Self-tolerance, or the ability of the immune system to refrain from destroying the organism's own tissues, is a prerequisite for proper immune system operation. How such self-tolerance is achieved is still a subject of debate. The belief that autoimmunity poses a continuous threat to the organism was challenged by data demonstrating that autoimmunity has a protective function after traumatic injury to the central nervous system. This finding led us to suggest the 'comprehensive immunity' approach by which autoimmunity is viewed as a special case of immunity, namely as a defense mechanism that operates by fighting against the threat of potential destructive activity originated or mediated within the organism, similarly to the immune defense that operates against the threat from exogenous pathogens. We present a primary mathematical spatio-temporal model that supports this concept. The numerical solutions of this model illustrate the beneficial operation of a well-controlled immune response specific to self-antigens residing in the site of lesion. The model also explains how the response to self might be tolerated on a day-to-day basis. In addition, we demonstrate that the same autoimmune response, operating at different levels of regulation, can lead to either an autoimmune disease or a degenerative disorder. This preliminary qualitative model supports our contention that the way autoimmunity is perceived should be revised. 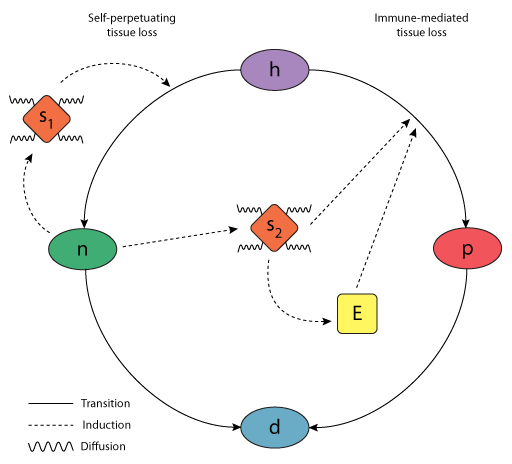 Schematic diagram of the mathematical model. Healthy cells (H) can be lost via two routes, 1) self-perpetuating death (H-N-D), or 2) immune-mediated loss (H-P-D). Derived from workspace Nevo, Golding, Neumann, Schwartz, Akselrod, 2004 at changeset 4926e8383778. Nevo et al. 's 2004 mathematical model of autoimmunity.